The Dockland Scout Project is on the Isle of Dogs, in East London. It lies just east of the financial City of London, and just across the River Thames to Greenwich, the maritime heart of the world. The centrepiece of the Project, the 'Lord Amory' vessel, is permanently moored just a few hundred metres from the Canary Wharf estate. This comprises of Europe's tallest skyscrapers, notably 1 Canada Square Tower (known as Canary Wharf) at over 800ft. These provide the Project with a stunning townscape backdrop, especially at night. As well as the office buildings, there are several shopping malls beneath the Canary Wharf estate, a London Underground tube station and several Dockland's Light Railway Stations. In the opposite direction, the vast expanse of the Millennium Dome can be seen with views of the River Thames. The entrance to the West India Dock, where our ship is moored is accessed from the Thames by a lock entrance and pedestrian/road bridge, known as the Blue Bridge. London Heathrow (LHR) Is on the Piccadilly Underground Line. Travel to Green Park and change for the Jubilee Line. Change at Canary Wharf onto the Docklands Light Railway. London Gatwick (LGW) Travel to London Bridge via Mainline train and then change onto the Jubilee Line to Canary Wharf, where you can change onto the Docklands Light Railway. London Stansted (STN) Is served by a mainline train service to Liverpool Street interchange. Travel on the Central Underground Line to Bank, where a Docklands Light Railway train can be boarded. Alternativly, National Express operate a regular coach service between London Stanstead and Stratford, change here for the Docklands Light Railway, Jubilee Line or D8 bus. London City (LCY) Take the Docklands Light Railway towards Bank, change at Poplar for a train towards Crossharbour / Lewisham. London Luton (LTN) Take a shuttle bus to Luton Mainline station and travel to London Bridge. Change for the Jubilee Underground line to Canary Wharf and then change for the Docklands Light Railway. EUROSTAR: Depart at Waterloo and take the Jubilee Line to Canary Wharf. Change onto the Docklands Light Railway. All other rail services: Make your way to a Docklands Light Railway station. These are Fenchurch Street (Tower Gateway), Limehouse, Lewisham, Greenwich, Stratford or Canning Town. Please refer to maps provided above for further information, Or visit T f L for live travel updates. Please visit www.thetube.com for further information. 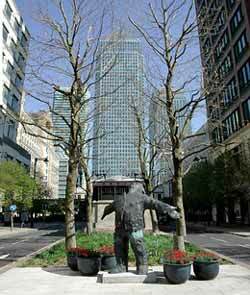 The nearest tube station to the Project is Canary Wharf. The Docklands Light Railway connects the Isle of Dogs with the City, South London, East London and the Royal Docks/City Airport. The vehicles operate at high frequency, usually about 1 - 2 mins between trains. Travelling on the railway is an experience within itself, as the computer-operated driverless trains travel along elevated track, providing excellent views of the area. D7: The D7 bus route, getting off just after the blue bridge (towards the Isle of Dogs). Runs from Newby Place, Poplar to Mile End Bus Station, via the Isle of Dogs. D8: The D8, getting off at Jack Dash House. Runs from ASDA Isle of Dogs to Stratford station. D6: The D6, getting off at Jack Dash House. The service runs between ASDA Isle of Dogs and Hackney Central Station. D3: The route runs from Whitechapel to Asda Isle of Dogs. 135: The route runs from Moorfields Eye Hostital / Old Street to ASDA Isle of Dogs (About a 5 min walk to the main gates). N550 (Night Bus): The route runs from Trafalgar Square to Canning Town and stops at the Blue Bridge next to the main gates.